Banana malpua is a rich and heavy malpua that is made using mashed bananas in a whole wheat batter normally. 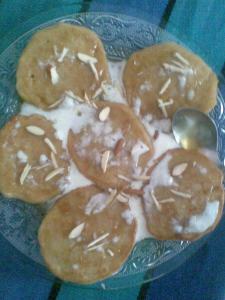 The batter is made using full cream milk and the malpuas are fried in ghee. But the same thing can easily be adapted for a healthy malpua when shallow fried, the texture changes a bit but it is saved from a lot of ghee. I generally make a quick pancake style malpua sometimes on a weekend brunch as the husband loved his desserts for meals. With a generous lashing of malai he is happy with his plate and wont go near any other food the whole day. Yes if you eat a few of them for breakfast, it keeps you full the whole day. ripe or overripe bananas 2 nos. mash the bananas and mix with flour and sugar to make a paste first and then add milk ...little at a time to make a batter similar to cake. Banana Malpua sounds tempting.Never heard of it!! Oh this looks delicious! Never had these before! Banana Malpua sounds good. Never heard of it!